SUMMARY. In this article we focus on hypomania and mania in bipolar disorder and, in all probability, only in some types of bipolar disorder. We deal with positive emotions, whose psychopathogenic role still receives too little attention in experimental and clinical psychology. We propose a hypothesis with regard to the psychological mechanisms involved in hypomanic and manic decompensation that posits in primis the secondary problem or secondary evaluation, which in this case takes on peculiar content characteristics, and subordinately affect as information. We shall see how a certain way of managing the experience of positive affect is involved in the etiology and maintenance of the hypo-maniacal and maniacal pathology, so much so that in this pathology, decompensation is to be found in positive affectivity or better, in the relationship that the person entertains with such affectivity. KEY WORDS: Hypomania, mania, positive emotions, bipolar disorder, dysregulation. RIASSUNTO. In questo lavoro ci focalizziamo sulla ipomania e sulla mania nel disturbo bipolare, e verosimilmente, solo in alcuni tipi di disturbo bipolare. E ci occupiamo di emozioni positive, il cui ruolo psicopatogenetico è ancora troppo trascurato dalla psicologia sperimentale e clinica. Proponiamo un’ipotesi sui meccanismi psicologici coinvolti nello scompenso ipomaniacale e maniacale, che vede coinvolti, in primis, il problema secondario o valutazione secondaria, che, come vedremo, in questo caso assume caratteri peculiari nel contenuto; e, in secondo piano, l ’“affect as information”. Vedremo come un particolare modo di gestire l’esperienza affettiva positiva sia coinvolto nell’eziologia e nel mantenimento della patologia ipomaniacale e maniacale, tanto che nel caso di questa patologia, lo scompenso è da ricercarsi nell’affettività positiva o, meglio, nel rapporto che la persona intrattiene con essa. PAROLE CHIAVE: ipomania, mania, emozioni positive, disturbo bipolare, disregolazione. Our hypotheses on psychopathologies are always based on the study of normality even before the study of the pathology itself, and on empirical data as well as the clinical experience of our working group. The difference between pathology and normality is not qualitative but quantitative. Psychopathology pertains when normal processes are prolonged or intensified beyond what happens in normal psychological life because of the activity of recursive psychological maintenance mechanisms. The starting point is the study of the mental state that characterizes normal and pathological experience. Mental state is constituted by representations of the active goals and beliefs on whose basis the person organizes his behavior1,2. It can be inferred from subjective experience or from the entire set of emotions, thoughts, physical sensations, and tendency to action that the person experiences in that moment. To give a practical example, if at this moment there is active in me the goal of making the reader understand what a mental state is and I believe I am not succeeding in doing that (I consider and feel my goal to be threatened), I will feel worried and I will try to find words and phrases that are more comprehensible, perhaps deleting several times what I have written and rewriting until I am convinced that what I have written can be understood. Once I feel sufficiently satisfied, I will move on to another sentence. The evaluation of “satisfaction” (goal achieved) will be based on the beliefs that I have in this moment with respect to what is comprehensible and what is not, to my image of the mind of the reader, and so on. But let’s look at a variant that will help us introduce the “secondary problem or secondary evaluation”. If I am convinced that in order to write in a comprehensible way I must not feel “negative” emotions, very probably I will criticize my emotional state of slight preoccupation, judging it to be an obstacle to achieving my goal, to fulfilling my desire to be understood. Instead of looking for more comprehensible words I will tend to want to resolve my emotional state, perhaps thinking and re-thinking of what a failure I am as a person, to the point of believing that I will never be able to do it, feeling demotivated, and therefore, leaving this essay incomplete. This self-critical evaluation and the consequent dysfunctional attempted solutions constitute what in Cognitive Therapy is called a Secondary Problem 3. The mental state that characterizes episodes of hypo-maniacal and maniacal (hypo/maniacal) excitation is that of potentiality, colored by the emotions of euphoria, irritability, anxiety (restlessness), and tied to the perception of having an enormous personal potentiality, without a corresponding project to be accomplished4,5. The person feels that he possesses greater personal power and resources but does not have a plan of what to do with all of this power. The goal that characterizes this state is not that of achieving some goal but of having the power to pursue any goal whatsoever, whatever one desires (personal potentiality). The patient is not interested in accomplishing something in particular, but wants to be (to perceive himself) capable of pursuing whatever goal he wants to pursue. The accomplishment of a specific goal always entails the passage from potentiality to realization and this is possible only when one is willing to give up the potentiality he believes he has (acceptance of loss). We shall see how this is related to the passage from normality to pathology. The euphoric person accelerates in order to accomplish, with the sensation that time is running out (restlessness and anxiety, mental and physical hyperactivity). The subjective sensation is one of great excitation and urgency to concretize the newly discovered potentialities. But having the goal of potentiality and not the accomplishment or concretization of some project, he doesn’t follow any project through to the end pursuing goals. He has the sensation of being able to do anything without knowing what he wants to do nor how. His attention disperses over a thousand possibilities. There is physical and mental hyperactivity, with numerous, fast moving ideas, greater loquacity, impulsivity, tirelessness, and reduced sleep. On the cognitive level, there is an overestimation of his own capacities with a significant increase in expectations of success and underestimation of dangers, costs, and obstacles. The subjective perception of having greater rights accounts for the great irritability, because almost any obstacle to his own potentiality is seen as an unjust wrong. Euphoria is a qualitatively different emotion than contentedness. It is not simply a higher intensity contentedness. They are two distinct emotions, with different characteristics. Contentedness is a basic emotion that comes with the accomplishment of an important individual goal and is associated with the conviction of possessing a specific good, while euphoria starts with the perception of potentiality (the good is potentiality). Again, contentedness is characterized by a feeling in which the prevailing sense is one of fulfillment and satisfaction, not restlessness. One who experiences contentedness is disposed to consume what has been gained, perhaps by investing it in other important goals. With contentedness, therefore, the individual stops to enjoy his success and utilizes the sensation of greater self-efficacy and energy to start again with another plan, which defines new objectives, ways of attaining them, and the resources needed to do so. The mental state of potentiality in itself is neither pathological nor pathogenic. All of us are capable of experiencing moments of euphoria, or excitation, in our lives, especially following a success, with the sensation of being able to accomplish and the will to concretize something we do not yet fully know. Generally, this does not lead to developing an episode of pathological mood alteration. Those who go so far as to become ill cannot manage to exit this mental state, which persists beyond its physiological time and intensifies to the point that its normal characteristics turn into symptoms. How does this happen? Why do some remain in the state of potentiality to the point of arriving at a hypo/maniacal episode? Starting from clinical experience, we have hypothesized until now that the individual who is suffering from pathological excitation of mood is stuck in a mental state characterized by the perception/conviction of having enormous personal potentialities, without having a clear and specific representation either of the good to be attained or of how to attain it (indeed the goal seems to be being able to pursue goals, that is, potentiality in and of itself). Furthermore, we have affirmed that this state becomes a pathological episode when it is prolonged over time and intensifies in its manifestations. What does empirical research tell us? Does it confirm our hypothesis? The results of experimental research over the last fifteen years6-23 demonstrate first of all that persons vulnerable to or suffering from hypomania and/or mania (hypo/mania) present two characteristic psychological traits that we can call 1) “Positive Emotional Reactivity Trait”; and 2) “Goals of Success and Pleasure Trait”. d. greater reactivity and persistence not for all positive emotions but only for those correlated to pleasure and success, the attainment of goals (pleasure and pride in oneself), and not for social positive emotions (compassion, love). Finally, anger seems to function as a positive emotion, but other studies are needed to confirm this. f. more mood-dependent self-evaluation compared to other people. During positive mood there is a significant increase in own personal value, likewise in moments of negative mood self-evaluation becomes significantly low. The studies tell us that these individual characteristics are not the problem, but are only a factor of vulnerability. 1. it is success events that predict hypomania and mania, not negative events nor generically positive events (this does not surprise us given the invested goals). c. decreased ability to recognize negative signals (for example, less ability to recognize facial signals of negative emotion), costs, dangers, risks and obstacles. 3. Finally, persons who tend toward hypo/mania present a greater positive memory bias compared to controls (they have three times more positive than negative memories during positive mood), while during negative mood they have an equal number of positive and negative memories. recompense) and risk awareness are state-dependent: drastic changes in them are observed only after a success or with a positive mood. Following a success, persons who tend toward hypo/mania have a higher expectation of success and they give less consideration to costs and negative consequences, that is, risks and dangers. They have more desire to achieve goals and tend to pursue goals that are more ambitious, difficult, and unrealistic. They increase their commitment and their activity. The vicious circle described by Johnson 23 is set in motion (dysregulation in goal pursuit): success = increased desire to achieve goals, increased expectation of success, decreased awareness of dangers = hyperactivity, hypomania = loss of sleep, use of substances, etc. = mania. Therefore, persons who tend toward hypo/mania have difficulty regulating their positive emotional state and its motivational force. The research thus confirms our hypothesis that the mental state involved in hypo/mania is personal potentiality (which seems to correspond to dysregulation in goal pursuit). It suggests to us that persons vulnerable to hypo/mania enter more easily into this mental state, or better, they seem actively to seek it, and find it difficult to give it up and go back to their affective and motivational baseline. We now ask ourselves why it is so hard for those suffering from hypo/mania to put the brakes on (as Johnson says). What accounts for the difficulty in regulating, modulating positive emotions tied to the perception of personal potentiality? Why do people get so stuck in the state of potentiality that they become ill? Part of the answer is contained in the vicious circle described by Johnson, in which the hyperactivity and loss of sleep that characterize the state of potentiality lead to an increase in excitation, to the point of mania. We will now try to add another part of the answer, knowing we will not succeed for the moment in exhausting the question, by bringing into the discussion two psychological mechanisms: secondary evaluation of the positive experience and affect as information. In its understanding of the pathogenesis and maintenance of the pathology, the cognitivist model relies in a significant way on the role of secondary evaluation of the experience or the secondary problem. As we have seen in our initial example, the secondary problem is constituted by the person’s critical evaluation of his own experience (thoughts, emotions, somatic sensations) and/or his own behavior and by the set of attempted solutions put into action to resolve the experience and/or the behavior assessed as problematic. A classic example is the fear of fear, in which the person gets frightened about something (1st problem) and judges the fear itself to be dangerous, particularly the somatic sensations of his own fear, such as tachycardia, becoming frightened by his fear (2nd problem). Clearly, a vicious circle is created which usually leads to panic (Figure 1). Another example in which the secondary problem plays a fundamental psychopathological role is the depressive disorder. In this case (simplifying a lot), the physiological correlates of mourning (understood in the broad sense, as a process that starts with an evaluation of loss and leads to acceptance of it) are self-criticized, judged to be evidence of one’s own incapacity, fallibility, impotence and so on, to the point of blocking the process of acceptance and triggering the onset of depressive disorder 4,5 (Figure 2). Up to this point, we have described the pathogenic role of a critical evaluation, negative with respect to the subjective experience and to the person’s own behavior, and it is that evaluation that cognitive therapy has classically studied and worked on in treatment. 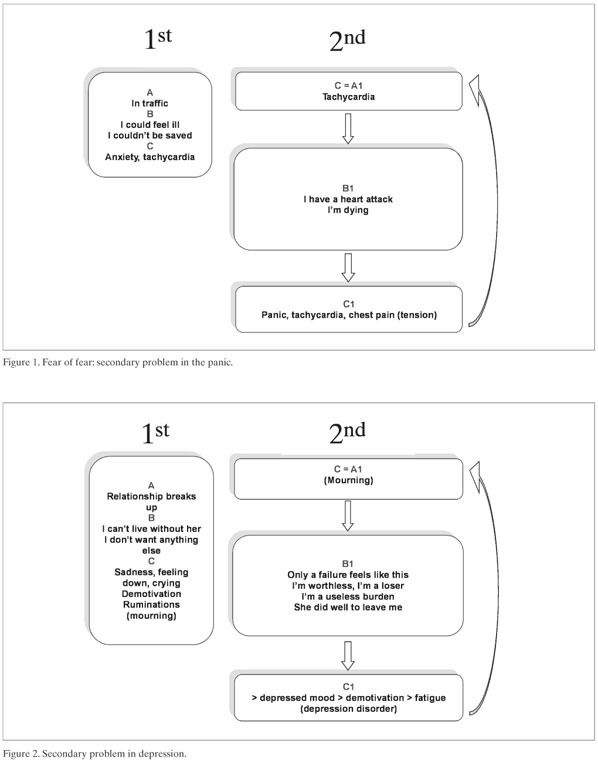 Clinical observation and empirical research on hypomania and mania in bipolar disorders allow us to hypothesize that in this case the pathogenic mechanism is not self-criticism, but on the contrary, the positive evaluation of one’s own positive subjective experience (personal potentiality) and one’s own behavior, coupled with attempts to maintain and exalt such experience (Figure 3). Following a success or in the presence of gratification that gives pleasure, or of an excitation owing to seasonality or a lack of sleep, the assumption of psychoactive substances or to the persistent absence of negative states (this latter being a situation that the person evaluates as positive), the person experiences the mental state of potentiality. Judging it to be extremely positive, a sign of strength, power and a success in itself, he tries to maintain it. The goal is to have and to continue to have the sensation of potentiality. He thus puts into action strategies exalting this state. An extremely important share of these strategies are ruminative. Research reports that persons vulnerable to hypo/maniacal decompensation present greater levels of positive rumination, both emotionally focused rumination (on sensations that the emotion gives, e.g., “you think of how strong and full of energy you feel”) and self-focused rumination (positive significance of the affective state, e.g., “you think of how proud of yourself you feel”). Moreover, such people present lower levels of dampening rumination, a strategy that dulls positive emotion (e.g., “you think of all the things that could go wrong”; “You remind yourself that this state won’t last forever”). They do not consider the transience of affective states. Thus, these ruminative strategies sustain and exalt the positive state and diminish the person’s capacity to react in a flexible way to what is happening around them. Evaluating positively the state of potentiality and having as a goal maintaining oneself in this state, makes it very difficult to get out of it, to put the breaks on. Indeed, getting out of it means renouncing potentiality, leaving it behind to move on to the consummation of the attained good in part through investment in other goods (mental state of contentedness). If in addition to the desire for the state of personal potentiality one also has the desire not to have negative affective states (anti-goal) because they are seen as signs of incapacity, personal disvalue, etc., the psychological mechanisms that facilitate the development and maintenance of hypo/mania are enhanced. Frequently, people who tend toward hypo/mania have families in which success and hyperactivity are exalted and negative affective states, above all those related to loss (sadness, depressed mood, sense of impotence, etc.) are judged to be evidence of personal disvalue and failure as a person 9,23. The affect as information mechanism consists in the use of emotion as information about reality. It was first studied with respect to anxiety. Persons with a tendency toward anxiety disorder tend to consider the anxiety they are feeling as evidence of the presence of a real danger: “if I feel anxious then there must be a danger”24. This threatening evaluation of reality naturally increases the anxiety itself, giving rise to a vicious circle that contributes to the onset and maintenance of anxiety disorder. Similarly, sadness can be used as information regarding the value and recoverability of the lost good. “If I’m feeling down that means I have suffered a grave and irreparable harm and that I am unable to remedy it”4,5. There seem to be individual differences in the tendency to confuse subjective data (personal feelings and emotions) with objective data (state of the world)25,26. 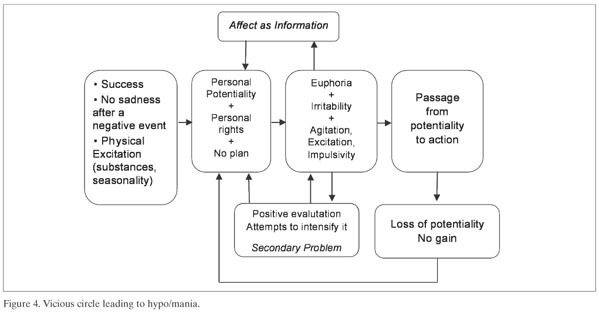 We hypothesize that persons with a tendency toward hypo/mania recur in significant ways to affect as information during positive affect experiences. They base their evaluation of reality primarily on their affective experience of personal potentiality. • reality is – or should be! – on my side (anger at unjust wrongs). Recourse to the mechanism of affect as information may explain the increased self-confidence and higher expectations of success and the decreased awareness of risk and danger and more generally, of negative signals, found in research studies on individuals with a tendency toward hypo/mania. Individuals vulnerable to pathological excitation present a significant preference, a pressing and absolute desire and a continuous search for the affective experience of potentiality, as well as the tendency to exalt such experience when it is present. Their positive evaluation of the state of potentiality and their attempts to maintain it and their reading of reality primarily on the basis of such a subjective state can explain the great difficulty of exiting this state in a healthy way, by putting the brakes on and accepting the loss of potentiality. The prolongation of this state and the exaltation of its manifestations lead to the pathology of hypo/mania. If beyond the goal of potentiality one also has the anti-goal of negative affective states or the absolute desire not to experience negative affective states, the mechanisms are intensified. 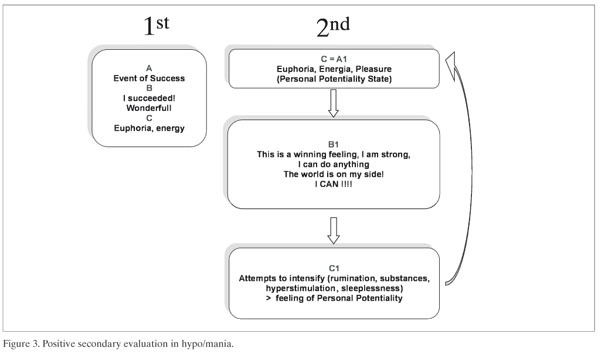 Figure 4 shows in synthesis the psychological mechanisms involved in the development of hypo/mania: positive secondary evaluation of the positive affective state of personal potentiality (consequent to a success, a seasonality, the assumption of psychoactive substances, etc. ); the negative secondary evaluation of negative affective states, which indicates the presence of the anti-goal of loss; recourse to affect information. These individual psychological factors make it hard to accept the loss of the state of personal potentiality entailed in putting the brakes on, and they facilitate the development of pathological excitation. The studies tell us that three-quarters of those who prevent mania use strategies of avoidance of gratifying situations such as, for example, sentimental relationships, friendships, career, etc.20. A patient of ours used to say: “i realize I have chosen to look at life in photographs… Because being elated is like smoking a cigarette; you can’t even take one puff if you don’t want to start again”. In our view, an effective psychotherapy for bipolar disorders cannot consist in reducing hypo/maniacal episodes only by way of the total avoidance of normal states of potentiality. This leads to low psychological well-being and low quality of life. Avoidance can be useful in some phases of treatment of the pathology, but only as one momentary strategy among other strategies, not the only and final one. Motivation to treatment entails the willingness to give up states of potentiality, which does not mean never being able to feel euphoric. To use in therapy only the avoidance of events and situations that may lead to experiencing a state of potentiality means leaving the patient at risk of relapse since she does not have the functional tools to manage that experience, which as a human being, she may have sooner or later, despite trying to avoid it. It is necessary to work with the patient to come to know the normal state of personal potentiality and to regulate it “from the inside”. Regulating it means not avoiding it but entering into it and exposing oneself to it gradually with tools crafted together with the therapist so as not to exalt it to the point of pathology, but learning instead how to give it up and put the brakes on. The therapeutic strategies, which in our view can be useful to increasing capacity to regulate the state of potentiality, are not limited to behavioral strategies applied to hyperactivity but entail strategies of a more exquisitely cognitive nature, such as: acceptance of the loss of potentiality by coming to know and reconstructing with the patient the mental state of potentiality and its psychological mechanisms; working on the secondary problem (negative and positive) and therefore also positive rumination; working on the affect as information tendency as well as on the tendency to underestimate risks and overestimate the likelihood of success (biases); working on awareness and “meta-awareness” of internal states (e.g., their transience, their being different from facts, etc.). All interventions must be carried out with particular attention to timing, taking into account the state of the relationship and the patient’s mental state. The therapy can be effective only if the patient allies herself with the therapist in the treatment and this can happen if the therapist: understands, respects, and starts from the reasons for which the patient seeks and wants hypo/mania (personal goals of the patient), rather than imposing “euthymia” (treatment goals); discovers with the patient the personal costs of her continual search for and maintenance of the state of potentiality and the benefits of giving up prolonging and intensifying that state; empathizes with the patient on how difficult it is to accept that loss, even after a downward reappraisal of the value of the loss 27,28. 1. Castelfranchi C. Che figura. Bologna: Il Mulino, 2005. 2. Castelfranchi C. Goals, the true center of cognition. In: Paglieri F, Tummolini L, Falcone R, Miceli M (eds). The goals of cognition. Essays in honor of Cristiano Castelfranchi. London: College Publications, 2012. 3. Ellis A. Reason and emotion in psychotherapy. Secaucus, NJ: Lyle Stuart, 1962. 4. Rainone A, Mancini F. Il disturbo bipolare. Un’ipotesi cognitivista di comprensione. In: Perdighe C, Mancini F (eds). Elementi di Psicoterapia Cognitiva. II edizione. Roma: Giovanni Fioriti Editore, 2010. 5. Mancini F, Rainone A. La dimensione cognitiva. In: Cassano BG, Tundo A (eds). Lo spettro dell’umore. Psicopatologia e clinica. Trattato Italiano di Psichiatria. Terza Edizione. Milano: Elsevier-Masson, 2008. 6. Biswas-Diener R, Wiese CW. Optimal levels of happiness. In: Diener E, Oishi S, Tay L (eds). Handbook of well-being. Salt Lake City, UT: DEF Publishers, 2018. 7. Lima IMM, Peckham AD, Johnson SL. Cognitive deficits in bipolar disorders: Implications for emotion. Clin Psychol Rev 2018; 59: 126-36. 8. Johnson SL, Haase CM, Beermann U, et al. Positive urgency and emotional reactivity: evidence for altered responding to positive stimuli. Emotion 2017; 7: 442-9. 9. Johnson SL, Carver CS, Gotlib IH. Elevated ambitions for fame among persons diagnosed with bipolar I disorder. J Abnorm Psychol 2012; 121: 602-9. 10. Johnson SL, McKenzie G, McMurrich S. Ruminative responses to negative and positive affect among students diagnosed with bipolar disorder and major depressive disorder. Cogn Ther Res 2008; 32: 702-13. 11. Peckham AD, Johnson SL, Gotlib IH. Attentional bias in euthymic bipolar I disorder. Cogn Emot 2016; 30: 472-87. 12. Ford BQ, Mauss IB, Gruber J. Valuing Happiness is associated with Bipolar Disorder. Emotion 2015; 15: 211-22. 13. Gruber J, Hay AC, Gross JJ. Rethinking emotion: cognitive reappraisal is an effective positive and negative emotion regulation strategy in bipolar disorder. Emotion 2014; 14: 388-96. 14. Gruber J, Purcell AL, Perna MJ, Mikels JA. Letting go of the bad: deficit in maintaining negative, but not positive, emotion in bipolar disorder. Emotion 2013; 13: 168-75. 15. Gruber J, Mauss IB, Tamir M. A dark side of happiness? How, when, and why happiness is not always good. Perspectives on psych 2011; 6: 222-33. 16. Kang Y, Gruber J. Harnessing happiness? Uncontrollable positive emotion in bipolar disorder, major depression, and healthy adults. Emotion 2013; 13: 290-301. 17. Gruber J, Culver JL, Johnson SL, Nam JY, Keller KL, Ketter TA. Do positive emotions predict symptomatic change in bipolar disorder? Bip Disord 2009; 11: 330-6. 18. Gruber J. A review and synthesis of positive emotion and reward disturbance in bipolar disorder. Clin Psychol Psychother 2011; 8: 356-65. 19. Gruber J. Can feeling too good be bad? Positive Emotion Persistent (Pep) in bipolar disorder. Curr Dir Psychol Sci 2011; 2: 217-21. 20. Edge MD, Miller CJ, Muhtadie L, et al. People with bipolar I disorder report avoiding rewarding activities and dampening positive emotion. J Affect Disord 2013; 146: 407-13. 21. García-Blanco AC, Perea M, Livianos L. Mood-congruent bias and attention shifts in the different episodes of bipolar disorder. Cogn Emot 2013; 27: 1114-21. 22. Tamir M. What do people want to feel and why? Pleasure and utility in emotion regulation. Curr Dir Psychol Sci 2009; 18: 101-5. 23. Johnson S. Mania and dysregulation in goal pursuit: a review. Clinical Psychological Review 2005; 25: 241-62. 24. Arntz A, Rauner M, van den Hout M. “If I feel anxious, there must be a danger”: ex-consequentia reasoning in inferring danger in anxiety disorder. Behav Res Ther 1995; 33: 917-25. 25. Mancini F, Gangemi A. Fear of deontological guilt and fear of contamination in obsessive-compulsive disorder. Psicoterapia Cognitiva e Comportamentale 2011; 17: 395-404. 26. Mancini F, Gangemi A. The relevance of maintaining and worsening processes in psychopathology. Behav Brain Sci 2015; 38: e14. 27. Mancini F. La mente ossessiva. Curare il disturbo ossessivo-compulsivo. Milano: Raffaello Cortina Editore, 2016. 28. Perdighe C, Gragnani A, Rainone A. L’accettazione del rischio: tecniche cognitive. In: Mancini F (ed). La mente ossessiva. Curare il disturbo ossessivo-compulsivo. Milano: Raffaello Cortina Editore, 2016.